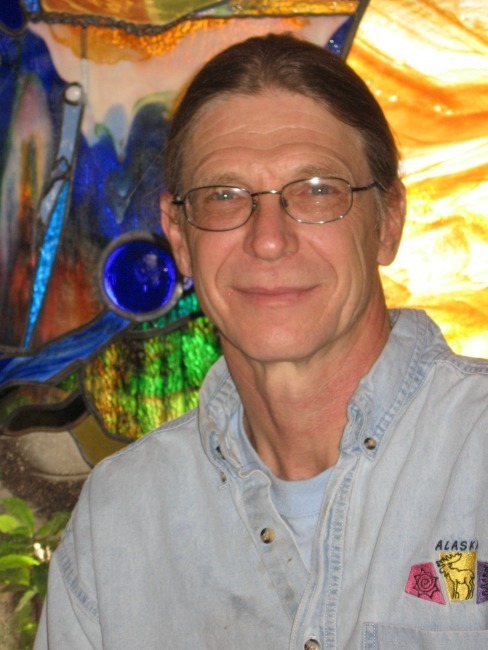 Mark Hall, Owner of Hallmark Art Glass in Kasota, Minnesota, has devised a new method to pick up kiln-formed glass and bring it to the glory hole. 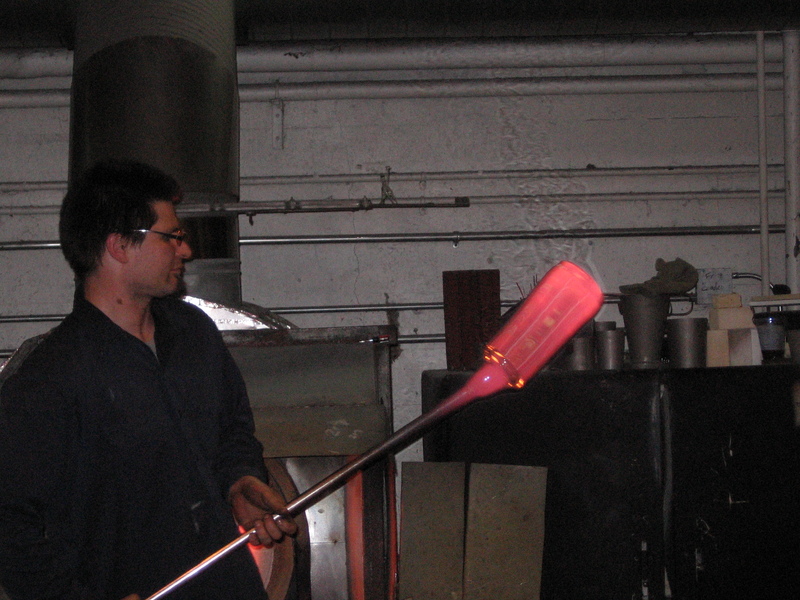 made to pick up warm on a collared blow pipe and blown into vessels. to create some pieces and demonstrate the technique to students. Mark will be appearing at the 2010 GAS Conference in Louisville, Kentucky presenting a lecture on this same topic. We believe this new approach will withstand scrutiny and provide another avenue for exploration and creativity. but can save Gaffers significant amounts of hot-shop time and money! Collars and punties are made from warm pick ups out of the kiln. It may not be your first choice, but blowing out kiln-formed cylinders keeps the glory hole hot and the energy bills reasonable. They're fun to make, too! 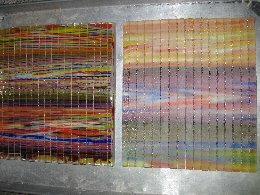 3/4" thick fused slabs are cut into square rods. 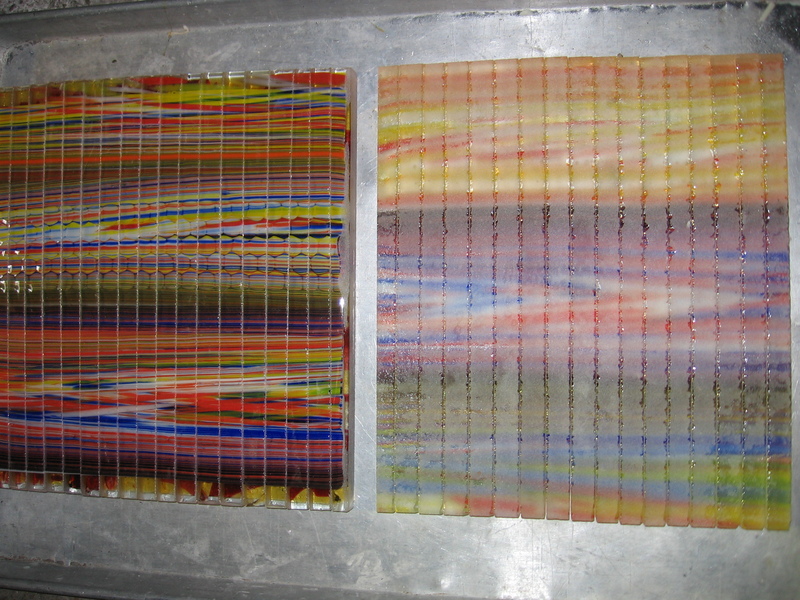 Each slab (shown at the left) was 12.5" x 12.5" square before cutting into square rods. Sq. 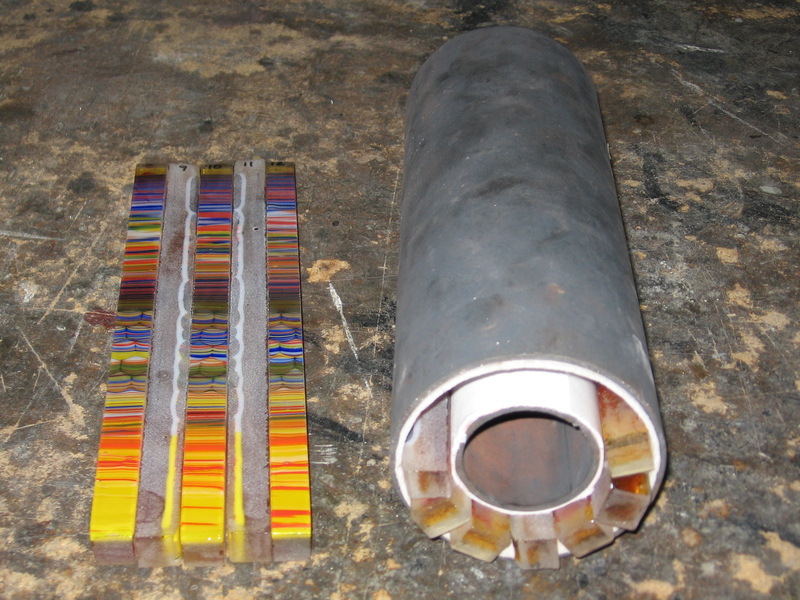 rods are arranged (some can be viewed on edge) and loaded into the cylinder mold. This is a pipe inside a pipe (both lined with fiber paper). 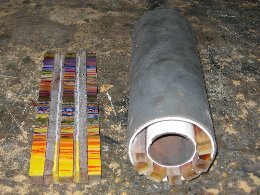 Mild Steel works for the pipe, but pits and scales off, messing up the kiln. Stainless Steel pipe is preferred. The mold is placed upright in the kiln ready for full fusing cycle. Note same diameter 'cookie' made at the same time using extra sq. rods. 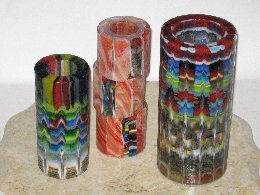 The pipe is 12" tall and the square glass rods are 12.5" long (it is OK if the glass sticks out 0.5" above the top). Some cylinders ready for the hot shop. 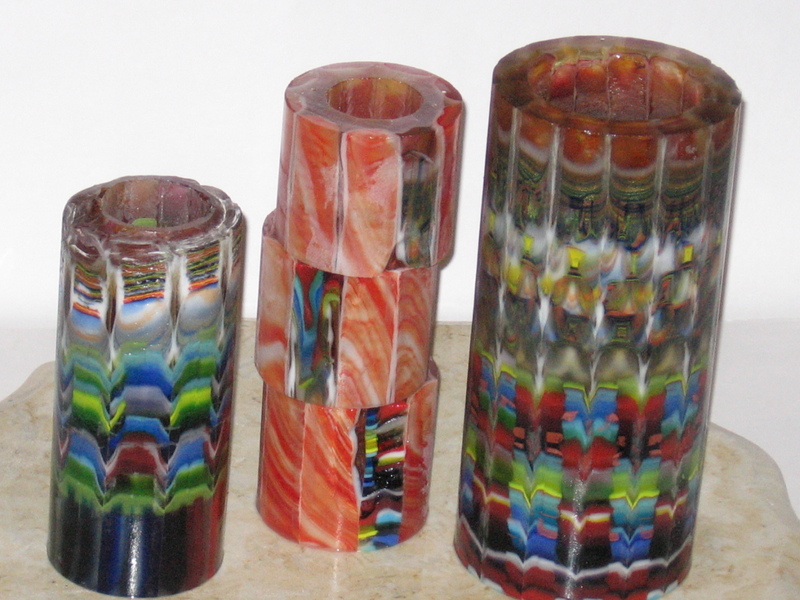 The tallest one was made in the forms pictured, 4" in diam. and the mold loaded with 12.5" long square rods. 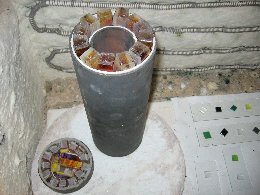 However, in the full fuse phase, material comes from the top of the rods to fill in the spaces in between them. 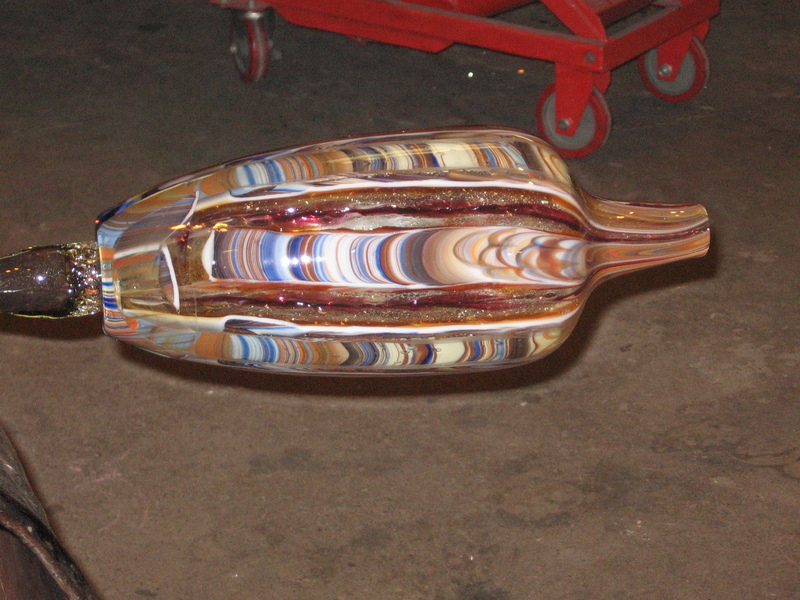 The resulting final length of the cylinder depends on this reduction, but it averages loosing 2 1/2 inches off the top. The jagged top is trimmed off providing an even-walled cylinder around 10 inches tall. A hot cylinder picks up a warm cookie to seal it off creating a solid colored even-walled bubble. extra care is needed to pinch off the end to keep the thickness similar to the walls. 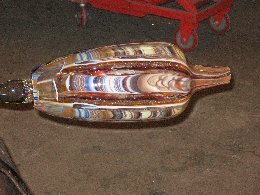 With solid color, you generally cannot see through the bubble and the bottom can get too thin if you don't protect it. Plus, you reduce the size in the process. It does have a nice appearance though. With a cookie you have another design element, you are guaranteed wall thickness, add volume, and it gives me piece of mind. 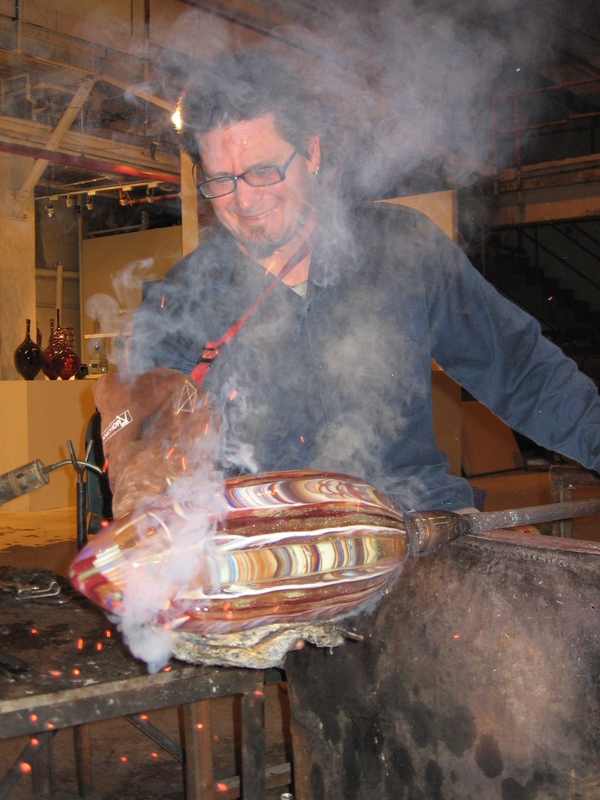 It also provides versatility providing a matching wad of glass you may decide to use as a foot instead of the end. Designer Mark Hall with Gaffer Michael Boyd. A cylinder makes a nice sized bubble. An idea of the finished piece. 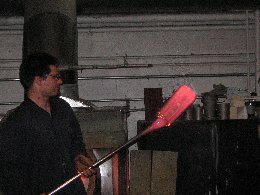 A skilled glassblower can make vessels 20"+ tall with these cylinders! 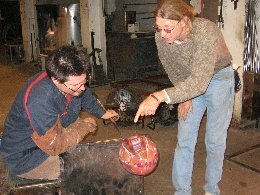 The piece pictured had to be shortened to fit into the smaller annealing oven we were using, and ended up 18" tall.